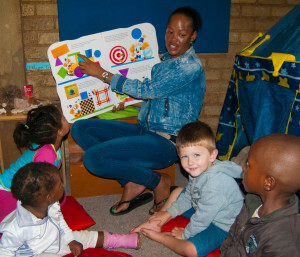 We source funding and donate books so that preschools can run a library benefiting their community. 67% of Africa’s adults are illiterate and the percentage is increasing. We provide children’s books for families so the children will have a foundation for their education. Initially Robyn Wienand (Founder) developed the Play-with-a-Purpose framework for Smile Education in the development of age appropriate educational toys. Nursery School-in-a-Box© consists of 8 toy boxes which stimulate all Play-With-A-Purpose development areas as well as manuals and training for each toy box. Educational Equipment developed especially for the Play-with-a-Purpose programme includes Vari-blocks, Treasure hunt, Chinese shoes and Shongolo.